Sustainable development should not be limited to calculating the amount of trees that can be saved and give a green image, it must also provide tangible data that will help to take action for reducing the electricity and paper consumption of the equipment and therefore reduce the carbon footprint. It is also create accountability of the company employees when they go to print. This commitment is likely to strengthen overall accountability of the employees, so their productivity. In the optimization of a fleet of copiers and printers, the server does not forget the environment. How Gespage acts on the environment? Reduce the power consumption and carbon footprint, green economies that will be added to those made by other Gespage functions. Generate awareness data to the company employees thereby motivating them to a citizen and responsible behaviour that goes beyond just a financial saving. Act on the environment that is optimize volumes by controlling their production and consumption of energy. 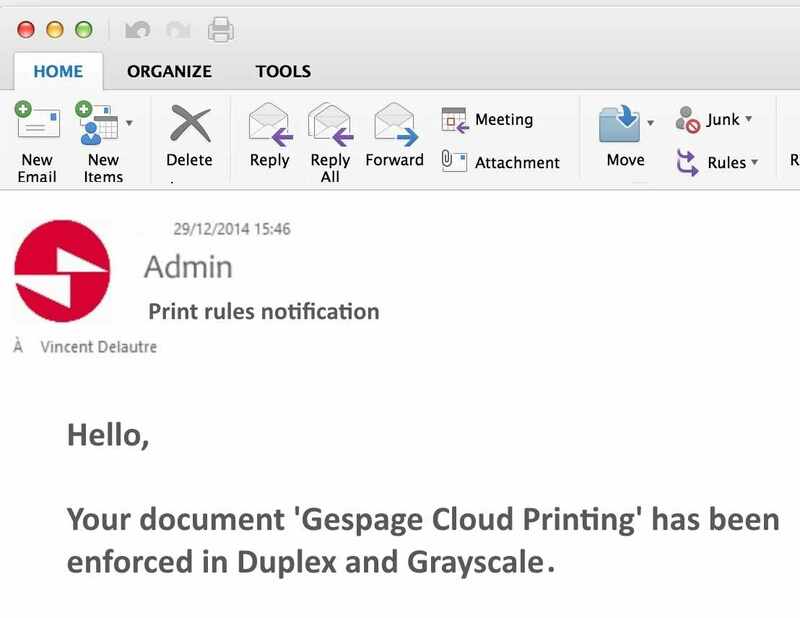 With the Print2me function, print jobs remain locked on Gespage server.Unprinted jobs beyond a certain time can be automatically deleted. Gespage keeps track of the cost that this job would have cost and can determine the savings made. With these tools of awareness and incentive Gespage is able to clearly display the savings made.Concret data for real savings.